Imagine you wanted to convert an article or a printed agreement into editable text. You could spend hours retyping and then manually correcting it. Or you could convert all the contents into digital format using a scanner (or a digital camera) and Optical Character Recognition application – in just a couple of minutes! Automatic OCR processing and PDF text recognition is now a necessity in many situations. With built-in Optical Character Recognition (OCR) technology, DocuFreezer lets you recognize text from various documents, thus becoming a useful OCR application. DocuFreezer is a reliable offline batch file converter for Windows 10 and older Windows systems. DocuFreezer can convert scanned images into editable text documents. The key benefit of this feature is the ability to get the text which can be copied and used somewhere else. It allows you to convert PDF to text, scanned images – TIFF, PNG, JPEG to text, as well as CAD drawings, Excel files, and other data into editable text documents. The output files can be plain text files (TXT) or searchable PDF files. The number of languages will be increased in further versions of DocuFreezer. If you would like to have more languages added, please contact our support team. When you scan a document, it becomes an image. Afterward, you might need to get the text out of it. The text that you can edit with a word processing, spreadsheet, or an editing program. Use an OCR converter for this task – just add images and let the software OCR your files. Once the OCR is done, text in searchable PDF documents can be selected, copied, and marked up. You can also make your PDF searchable. DocuFreezer can create PDF containing editable text out of an image-only PDF or another filetype using the built-in OCR technology. 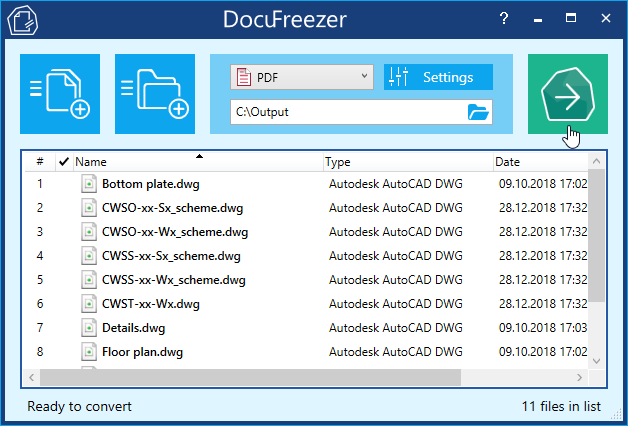 DocuFreezer supports DWG and DXF drawings as input formats. Thus, you can get the text out of your CAD drawings in the form of searchable PDF or TXT. Simply add the files to the list, select PDF or TXT as Output file type, go to Settings and check option Make PDF searchable (OCR) or OCR (Optical Character Recognition). Please note, that text may be incorrect or corrupted after conversion with OCR. Make sure that the input files have high quality – large format and high resolution. Optical character recognition (OCR) is a method of converting a scanned image into text. When a page is scanned, it is usually stored as a bitmapped JPEG or TIFF format. When the image is on the screen, we can read it. But to the computer, it is just a series of black and white dots. The computer does not recognize any “words” or actual characters on the image. DocuFreezer can help you turn a flat image into letters and characters. Try the OCR feature in the free version of DocuFreezer – download the program using the button below.